Yes, that is the correct price. It's a very limited variant. That’s cool, bossman! Turns out that they sell 5 of the 6 variants (the Fried Pie/Books a Million one I’m going to have to hunt for). When you order all 5 of them and use the coupon, the total came out to be $60, so about the same as store price for each and tax and shipping, so it’s perfect cost wise. The only downfall is that they charge immediately rather that when the preorders ship. Oh, well. Thanks again for the code and quick response! Oh Jesus Christ Almighty that cover artwork looks terrible. Oh jeez that cover unironically looks terrible. This has to be one of the few times where I actually prefer the regular cover. It's neat. the colors are beautiful, and the characters are cute and pretty. Now that might not be my stuff. too much on the "moe" style that is the trend nowaday. asdfghjkl I know the art is good but I really cannot like this one...too modern anime/"moe"/girly for my taste. 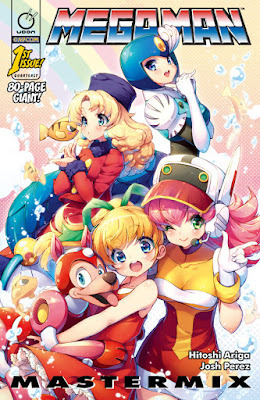 I sincerely hope people don't have the wrong impression on Ariga's work with this cover. I think that won't be a problem, since it is just one of the variants. Really cranked up the moe on that cover.